of Water journey project. We have learned all about how important water is to our world and that many people don't have access to safe, clean water. We want to help change that! 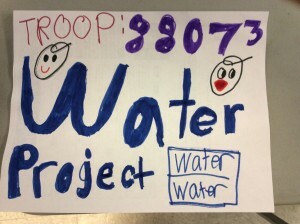 We are doing a "water-a-thon" event to raise money for The Water Project. Please consider donating! 04/29/15 Karen Sims $68.00 Great job Vivi! 04/24/15 AnneMarie Sharp $68.00 Great Job Isabelle and everybody in the Troop!! 04/19/15 Laura Massey $45.00 Great job! 04/19/15 Matt Parkes $34.00 Super work Kate and everyone! 04/11/15 Rachael Tearle $62.04 Kate swam so far! Good job Kate! 04/09/15 Caity And Rosie Beard $25.00 Go Vivi! !